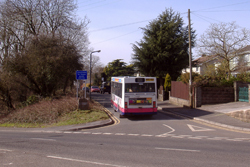 Wrington, Redhill and stops along the A38 are now served by the A5 community bus service which links villages in the area with Bristol Airport. This bus also goes to and from Yatton via Stock Lane and Congresbury, connecting with the X1 and other buses on the A370 as well as Yatton Station. 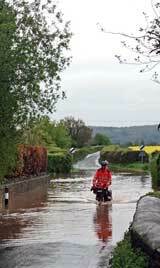 Unfortunately, there is no bus service direct to Weston or Bristol from Wrington. One option is to change at the airport and use the Airport Flyer, the A1. The Flyer offers a 24 hour service between the airport and the city centre, with departures every 8 minutes in peak periods and a journey time of around 30 minutes. See here for details. It should be possible to catch the SW Falcon bus from Redhill and stops along the A38 to go direct to Bristol. See here for details of this 24/7 bus service. The A3 service now connects the airport with Weston, using Downside Rd, Brockley Combe and the A370. The timetable is available here. Bristol Airport offers a concessionary fare scheme for local residents using the Flyer to travel in and out of Bristol. For further information on this, and a scheme under which people living in or close to Downside Road can park at the airport free for up to 20 minutes, see here. If you live near the A38 the U2 (introduced by Bristol University and First Bus) is open to the public and runs on an hourly basis down the A38 from the veterinary school in Langford to the University campus on Queens Road, Monday-Friday, 8.00am-6.00pm (the full timetable is available here). Of course, various commercial and charter flight operators offer air travel to many destinations through Bristol Airport, which is readily accessible to local residents and businesses. For information on travel and transport to and from the airport see the Bristol Airport website or here. Arrow Cars is the dedicated on-site taxi operator at Bristol Airport and can be contacted on 01275 475000. For further information see here. Rail services are available nearby at Yatton station although there is no direct bus service linking Wrington with Yatton. Information on rail services at Yatton and in Bristol is available through the Useful Links page. The Wrington Minibus Society operates a minibus and offers a valued community transport service, providing a range of regular services, special trips and hire of the vehicle. For further information on services contact Alison Robbie on 01934 862953 or Alan Wilson for private bookings, 01934 862303, or see here. The Wrington Helpline can help with transport for residents needing access to medical services and facilities. To contact Helpline please call 07092 983064, leave your name and telephone number and then someone will call you back. For further information see here.